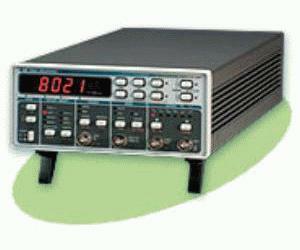 Model 8021 is a high performance pulse/function generator. It provides the basic features and functions of the Model 8020. Additional waveforms include Positive and Negative going Ramp, Pulse and Pulse complement. Pulse width and Ramp width ranges are controllable within an extremely wide range of 25.0nS to 9.99S. Its versatility ensures a broad range of applications especially where complete control over pulse or ramp parameters is required. Rapid, repeatable testing is assured by thirty non-volatile front panel set-ups, which give exact reproduction of previous tests no matter how complex.